What are some interior design ideas or suggestions? Interior decorating refers to the art and science of making an interior space more aesthetically pleasing and functionally useful for its inhabitants. While the exterior of a building can sometimes also be included in interior decorating, the term usually refers solely to the interior design. Anyone who has ever decorated a home or office has taken part in interior design. It’s a popular topic for many home and garden entertainment television shows is a popular hobby for many people because you don’t need a degree to take pride in decorating your home. An interior designer is someone who is hired to design a space. While this job may seem like simply choosing paint and placing furniture there’s actually much more to it. Interior designers take part in the conceptual development and execution of their design. They often are involved in site visits and working with construction management especially when it comes to large commercial buildings. You can hire an interior designer to redecorate a room in your house or to help you completely remodel it. When it comes to large remodelling jobs hiring an interior designer will help ensure that you get the maximum amount of use out of the space you have. They will also help ensure that the design does not cause any safety hazards. Interior design is seen as an art of composition because it requires designers to bring various pieces together to form one stylish look.They handle every part of the rooms look from the material of the floor in some cases to the knick-knacks on the bookcases. It can often take months for an interior designer to complete their job because so much goes into it. If interior design is something you love then turning it into a career might be just what you’re looking for.While some places require interior designers to have licenses these laws vary by location. If you’re looking to change careers without taking on more student loan debt, interior design isn’t a bad choice. The majority of interior designers get their start in the business by being the assistant to an existing firm or designer. However, as with most jobs, it is becoming more and more common for people to get college degrees in interior design. It is a popular major in many Chinese universities. Schools in the United States and the UK offer courses like Interior Architecture as well. Almost a quarter of all interior designers own their own firms so if running a business is something you’ve always dreamed of you’re not alone. The other seventy-five percent of professional interior designers are employed in firms of all sizes. Architecture firms often hire interior designers to decorate the lobbies and waiting areas of corporate and government buildings. The majority of non-residential buildings you enter probably had an interior decorator, which shows just how much need there is for them. Wood is a traditional, beautiful, and always modern interior design material. With softwoods and hardwoods the variety of colours, grain patterns and textures can please any taste and emphasize any interior design style. Lushome shares helpful information about the most popular wood types to help select the best room furniture, wall and flooring ideas for your modern interior design.These wood types define the latest trends in decorating and design. Wooden furniture, wall and ceiling designs and floor ideas look spectacular and warm. The downside is cost. Many woodworking projects, mainly which use expensive hardwoods and exotic wood types to accentuate the modern interior design, can be costly.Here is a collection of various wood grain patterns, colours and textures, and modern interior design ideas for inspirations. The most popular wood types include oak, beech, pine, cherry, alder, maple, walnut, poplar, birch, mahogany and teak. Each of these woods has unique look and properties. Oak wood is perfect for modern furniture and flooring ideas. Oak is durable and comes in a red and white variety. The grain produces beautiful patterns enhancing classic and modern interior design. Beech wood is versatile, lasting and beautiful. Creamy yellow color and yellowish brown colors add warmth and brightness to modern interior design. Beech wood materials are flexible and used for modern furniture design in stunning banded forms. Pine wood is a cheap and widely available type. Perfect for interior design and decorating, pine wood brings unique aroma into homes and create warm and cozy rooms. Cherry wood is a prevalent wood type for luxurious interior design and decorating. Beautiful cherry wood furniture and doors get gorgeous with age. The cost of cherry is high, but its fantastic look and dark color are worth the money. 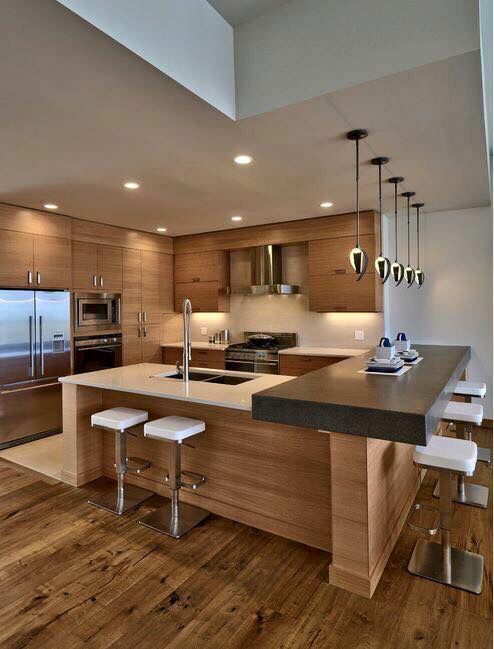 Walnut wood brings rich brown colors into modern interior design and decorating. Exclusive and expensive, walnut wood furniture looks fantastic, adding great accents to classic and contemporary interior design. Alder wood furniture, decorations, doors and windows designs in pleasant golden colors add soft texture and bright look to home interiors. Perfect for kids room design and decorating, alder wood furniture pieces are warm, attractive and comfortable. Maple wood comes in soft and hard types. Both stain out better than most of the woods and create beautiful wood floors and room furniture which are less expensive. Larch wood has a unique texture and grain patterns. Moisture resistant and vigorous, larch wood looks attractive and luxurious in modern interior design. Perfect for exposed ceiling beams, room furniture, and wall structures, larch adds light color and unique character to the interior design. Ash wood is pale to white-colored material with a straight grain. Ash wood flooring and architectural elements are strong and durable, blending light golden color into modern interior design and decor. Birch wood comes in yellow and white varieties. Birch wood is less expensive than other hardwoods and looks like maple. Birch wood furniture is beautiful and attractive. Mahogany wood is a great furniture and door design material. Mahogany wood produces beautiful furniture and doors with its deep red tinting and straight grains which beautify interior design and give living spaces that exclusive and expensive look. Poplar wood is one of the lower costing wood types. Poplar wood is a softer hardwood. Poplar furniture is affordable and unique, looks great, especially stained or painted. These types of wood are the most popular. Also, you can use salvaged wood pieces for modern interior design. Salvaged wood is one of the most popular latest trends in decorating and design, bringing beautiful, natural and unique interior design materials for creating modern homes.Select your favourite wood types, colours, texture and grain patterns, and bring wooden furniture into your home interiors if you appreciate the beauty of natural wood floors, doors, and room furniture. Wooden furniture, decor accessories, lighting fixtures and architectural features enrich modern interior design and decorating, blending warmth and cosiness with creative ideas and versatile look into living spaces.For more information about wood, visit ufmdesigns website.